As some of you predicted in your comments, I did not like the Mission Falls Cotton. It turns out, I should just stick to my knitter instincts. I never like to knit with cotton, and this yarn was not the exception. But I did head back to another LYS and I found the Berocco ___ yarn, and bought it in red, white, and blue, and am enjoying knitting the Pinwheel Blanket out of that. 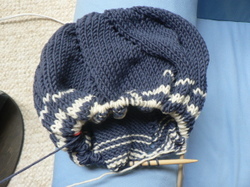 It's just nice to have the needles in my hands again. In the meantime - gotta think about how to transition Nutella into a big girl bed so her little sister can have the crib when she gets here! A quick trip to my LYS, and 12 hanks of Mission Falls Cotton later, I am on my way to starting the Pinwheel blanket. Has anyone heard any good/bad/ugly about this yarn? I know a lot of people who use it, and I am not usually big on the cottons, so if there is a warning to be had, let me know sooner, rather than later! Also - does anyone know of a baby bootie pattern where the booties actually stay on the kids' foot?